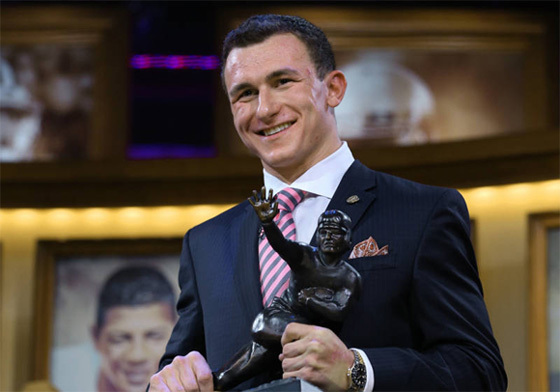 Texas A&M freshman quarterback Johnny Manziel accepts the 2012 Heisman Trophy award. Barnes & Noble College congratulates Johnny Manziel, the Texas A&M quarterback who was named winner of the 78th annual Heisman Memorial Trophy on Saturday night. As the first freshman to ever receive the award, the 20-year-old garnered 474 first-place votes for a winning total of 2,029 points. The accolade of being the most outstanding player in collegiate football capped a successful week for Manziel, having also been awarded the prestigious Davey O’Brien National Quarterback Award on Thursday night. Nationally recruited out of high school, Manziel took over the Aggie quarterback position vacated by Ryan Tannehill who had left for the NFL and the Miami Dolphins. Although his season had an inauspicious start, the ‘Johnny Football’ legend began to establish itself for Manziel as a dual-threat quarterback with an impressive ability for inventive plays. He emerged as a strong contender for the Heisman after the 29-24 upset over front-runner Alabama in Tuscaloosa. 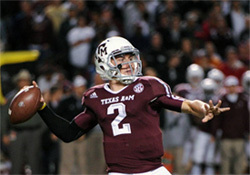 The game proved a touchstone for him, contributing 345 of the Aggie’s 418 yards of offense and two passing touchdowns. Heisman Trophy winner and Texas A&M quarterback Johnny Manziel. Manziel also disinguishes himself as the first quarterback in Southeastern Conference (SEC) history, and only the fifth player ever in the NCAA, to have achieved 3,000 passing yards and 1,000 rushing yards in the same season. His impressive stats also include a new SEC record with 4,600 total yards in a single season, and he holds the Aggie record of accruing eight straight games with 300 or more total yards. To win the Heisman, Manziel beat out Notre Dame middle linebacker Manti Te’o, who had something of a record himself, with the most points scored by a defensive player in the award’s history. Kansas State quarterback Collin Klein earned third place with 60 first-place votes and 894 points, while USC’s Marqise Lee took fourth place. Named after former Brown University and University of Pennsylvania player, John Heisman, the award is the oldest in college football with eligible voters represented by a survey of sports fans, sports journalists and previous Heisman winners. Guiding Texas A&M to an unprecedented 10-2 season in the their new conference, Manziel compiled impressive victories over then-top ranked Alabama, Mississippi State and Louisiana Tech. But despite his incredible achievements, Manziel was still able to remain humble upon receiving the award – and the Aggie’s 12th Man tradition, where the entire student body is ‘always in the stands waiting to be called upon if they are needed,’ was top of mind.